It’s a time for the undying regret you live with all year to shuffle forth like sorrow zombies. Purge yourself of your failed efforts, indiscretions and occasional felonies. Bathe in the purifying rejuvenation of nougat and assorted chocolate confections. Here, I’ll go first. I’m sorry I confused “Milky Way” with “Three Musketeers”. Clearly, I’m a horrible, horrible person. I’m sorry I compared your smile to a jack-‘o-lantern. It was rude. Still, burning me with your candle was uncalled for. I’m sorry about my leather trick – or – treat bag. But was I supposed to do with all those scabs I’ve been saving? I’m sorry the Halloween party broke up early. But if people don’t like to play bob-for-fingers, they should say so on the RSVP. I’m sorry that “dead” isn’t a color. It totally should be. I’m sorry I didn’t tell you I was bringing a friend along. But what was I supposed to do? He wouldn’t stay in the casket. I’m sorry I made fun of your costume. I totally wasn’t fooled, though. Wait…who are you? Oh, sorry, I thought you were Steve. But he doesn’t have two heads. My bad. I’m sorry I screamed “This house is haunted!” In front of those people who wanted to buy your house. I really thought that shower curtain was spooky. Besides, I think you can probably collect insurance for the damage. I’m sorry about sending your grandma the first prize for best costume. I thought she was a great zombie. I had no idea….well, my condolences. I’m sorry for the rearranging of the pumpkins and other gourds on your porch. I agree phallic displays are not appropriate for Halloween. That’s totally a Christmas thing. I’m sorry I called at midnight to see if you were still alive. Excuuuuuuuse me for caring about your mortality on all hallow’s eve. I’m sorry I used super glue to hold my mask on, but those damn wimpy strings never stay attached. No big deal. I can be “Donnie Osmond” next Halloween too. And Thanksgiving. And Christmas. And, um, every other day. I’m sorry I called the blood bank and said, “this is Dracula. Can I place a carry out order?” Ninety- seven times. I’m NOT sorry I bought the ten pound bag of Reese’s Pieces at discount barn I AM sorry I ate the whole thing. And also sorry about your carpet. I’m sorry I ruined your HALLOWEEN party. Excuse me if I wanted to play something more original than charades. I thought “reanimate the dead pets” would be timely and fun. Well, it’s not an official title or anything. But I’m thinking of calling it that. So, pull your blanket up over your head and grab hold of the living thing or whisky bottle which provides you the most comfort because I’m going to tell you why this is THE HOUSE OF DEATH. Okay. Don’t say I didn’t warn you. 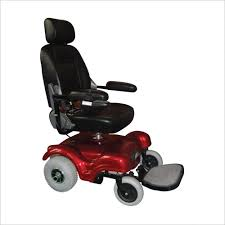 Several weeks ago, I drove by the nondescript* (*except as noted above) house and only noticed it that day because there was an electric wheelchair much like the one pictured above (Thanks, Google!) with a generic FOR SALE sign on the seat. It flashed through my mind how sad it must be that this person’s mom or dad or grandparent or something had done and now they were left to try to raise some cash selling the deceased’s wheelchair. There were two chairs in the yard. And the day after that….Three. Ever since that first day, the number of chairs has fluctuated between one and three. Sometimes the chairs are red and sometimes blue. They always have a FOR SALE sign on them. It’s such a standard pattern now that it’s obvious what’s going on. I wanted to get a picture of the actual scene, but it’s a busy street, difficult to just stop and snap a pic. Also, you know, demons. And, side note, who the hell is buying a used wheelchair someone parks in their front yard? So, listen, if you or someone you love uses an electric wheelchair, watch your back. Or his! Or hers! ’cause these very distinct, nondescript, white house demons are coming for you. And, as far as I know, they don’t take credit cards. I’ve done a fair bit of hotel staying lately. I’m not a world traveler, but I’ve stayed in enough hotels to become simultaneously intrigued and repulsed by the concept of the “continental” breakfast. I don’t know what the origin of the continental breakfast is. I could google it, but with the pace of modern society, even that simple, quick solution somehow feels lazy and bourgeois (cool word alert). Plus, I’m writing this paragraph at a location where there’s no Wi-FI, so I can’t look it up. It seems unlikely I will bother looking it up later. If, when you read this, this paragraph isn’t actually here, then you’ll know I did look it up after all. Of course, if I changed it, then you won’t know the difference…It’s like on Doctor Who (ding – obligatory reference) when stuff happens to people and then they change history and can’t actually remember what happened before. Anyway, the typical American hotel continental breakfast appears to consist of powdered eggs, Frosted Flakes, and waffles you have to cook yourself in an incredibly simple waffle iron that confuses most people. Sometimes, motels will mix it up a little with a bowl of browning fruit or breakfast burritos and some powdered donuts, but this is the basic fare. What’s “continental” about this? Where are the croissants? The espresso? Truffles maybe. And doilies. You can’t eat doilies (though they’re probably indistinguishable in taste from the waffles), but my hunch is continental breakfasts should be steeped in doilies. And fresh-cut flowers. Everyone involved should have some sort of European accent. Don’t really care which one. That’s “continental” in my mind. Instead, what we’re really getting in these hotel continental breakfasts is what we’d make in our own homes only with a lot of mostly unwashed strangers wandering through our kitchen getting their germs on our muffins. And that, I guess, is what it’s all about. Get it for free, whatever the sacrifice. It’s the American way. Hey, dude, pass the stale blueberry muffins. And don’t even think of grabbing that luggage cart in the lobby first. That sucker’s mine. Back in high school physics class, so long ago a stegosaurus gave me my first wedgie, we did an experiment. The teacher gave each student like ten inches of masking tape and four plastic drinking straws. The mission was to build a craft that would protect a raw egg from cracking when dropped. Students pitted their creations against each other to see who could drop theirs from the highest point. I won in my class. My best friend won in his class and another friend of ours got the best performance of all the classes. The egg in his egg ship survived a drop from like three floors up. I was on the Internet recently trying to find some of the details of how this experiment worked. I couldn’t find any. Oh, there were plenty of examples of how to do the egg drop experiment, but none of them were MY experiment. The first clue? I WAS LOOKING ON THE INTERNET. When I was in high school, no one had the Internet. Lots of people had HOME COMPUTERS – Volkswagon Bug sized, desktop computers people kept in their living rooms for the family to use to play Oregon Trail or something. The egg drop stuff I read the other day recommended students look to the Internet for ideas on how to build their egg ships. When my friend and I wanted to learn how to build our ships, know what we did? We got some straws and tape and built prototypes. The. We got a carton of eggs and tried them out. Broke a lot of eggs for sure, but we learned instead of memorizing something someone else posted on a website. The next thing I noticed was the budget. One site had a list of like a dozen items you could use – cotton balls, straws, Popsicle sticks – a ton of stuff. Another site didn’t give a specific component list, but did admonish the student not to spend more than A HUNDRED DOLLARS! ONE HUNDRED . DOLLARS. On ONE egg ship. In my day, all of the ships in my school combined probably didn’t cost a hundred dollars. I don’t know why this bothers me. I’m not really a get-off-my- lawn guy. I don’t object to calculators as long as kids learn math fundamentals first. I don’t even hate the Internet. Hell, like most of us, I carry it around with me on my phone. I write a blog. Me and the Internet lossy -face constantly. But for some reason, the idea of taking this simple little experiment that required hands-on, trial and error to teach scientific principles has been undermined. It feels like technology is being used as a cheat, not as an aid. I feel a little better now. Nice to get that off my chest. Feeling kind of hungry. Think I’ll go have an omelette.